Farshid Ketabchi's Introductory note on BPM is very remarkable. It starts with a good overview of the Business Process Management (BPM) benefits, the market and the vendor landscape very well. The piece that stands out of the crowd is the clear distinction he makes between "BPM as a business management discipline" and "BPM technology". I believe that distinction is crucial and not yet properly understood. Traditional BPM vendors have everything to gain by keeping that separation blurry. In this post, I'll show that this separation is vital for understanding that IT people should drive the selection of BPM Systems, not business people. The distinction between BPM as a management discipline and BPM Systems (BPMS) is an observation rarely pointed out by BPM vendors and therefor worth while highlighting. BPM vendors too often try to blur the distinction between the software product they offer and BPM as a business management discipline. Next they talk at length about the benefits of that combination to show that their software product brings all these benefits as a package that you can just buy off the shelf. It's basically any manager's job to make an organization run more efficient. So basically any manager is managing business processes. BPM vendors are happy to offer this skill in a box. But that is a false promise. BPM software cannot replace the management skills necessary to manage business processes. Which are the important business processes in this organization? What are the steps that we should automate and what should be done by people? Which people should get involved when? What is essential for this organization and what is detail? It requires a manager with vision and analytical skills to perform the business process management discipline well. A BPM software solution cannot replace that vision and analytical skills to optimize the performance of an organization. That remains the key responsibility of the business people. BPM software can never claim to take over that innovation and change management aspect. Business people should control and drive the optimization of business processes. 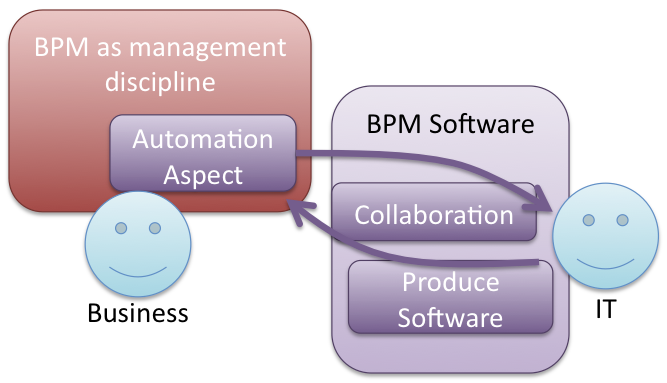 BPM systems too often try to put non technical business people also in control of the software automation. That is I believe a common pitfall for BPM systems. Instead, IT should have a BPM System at their disposal to help them automate software support for those business processes faster. Non technical business people should not focus on producing software. Instead they typically focus on requirements documents and process analysis diagrams. And the collaboration aspect of BPM Systems should allow for discussions between business and IT people about all the artifacts that matter in the collaboration. Generic social features around the artifacts that matter to both the business people and IT people is what the BPM System should offer for the collaboration aspect. That's not rocket science. It does not take special management skills to evaluate collaboration features. The point here is that BPM Systems have a pure software development aspect and a social collaboration aspect. The pure software development aspects can only be properly evaluated by IT people. And while the social collaboration aspect matters to both the business and IT people, it doesn't take special management skills to evaluate those collaboration features. Hence the conclusion is that IT departments should drive the selection of BPM Systems, not the business managers. One of the main questions is to know who is the resposible of implementing business rules. Banks usually use business people to write rules in a simple declarative computer language. But most companies need special rules that are not suitable for rules. In this case I think there is no need to use IT to code some simple logic in Java. From my point of view, BPM systems should have a good set of libraries to leverage most programming efforts. This way, business people can really code task logics. According to my experience, many (or even most?) companies have not recognized the value of BPM as a management dicipline yet. If at all they associate "IT-stuff" with BPM, which is only half of the story. BPM should first look at the business processes from a strategic point of view (and optimize them) and then seek for support by IT on the more operational levels where appropriate. BPMS should clearly be selected, owned, and managed by IT. I could not disagree more. BPMS is a tech resource that is used to automate processes. But if this resource is not used to structure a process correctly, monitoring the right KPI's and measuring the process outcome little value is added (well it provides the automation capability but this is low hanging fruit). Of course, system vendors want to continue to make things fuzzy between BPMS and BPM, but it may be that the hype fades quickly if implementation is not within the business context: the BPM foundation. Reading your post, I think we are in agreement. I also agree that business people should be in the driver seat. Business people should take the responsibility and make decisions. IT folks should serve business people. And with the right BPM technology, IT can serve the business people on demand delivering true business agility. Also I agree that BPM has been too much focused on fixed process designs. More social features and process definitions based on ad hoc process steps should be added. Watch Activiti in the coming months as we have a clear vision in that respect. Hi Tom, thank you for the positive reference to my article. Interesting point you raise here. I added a reference to your post in my closing paragraph. Best.